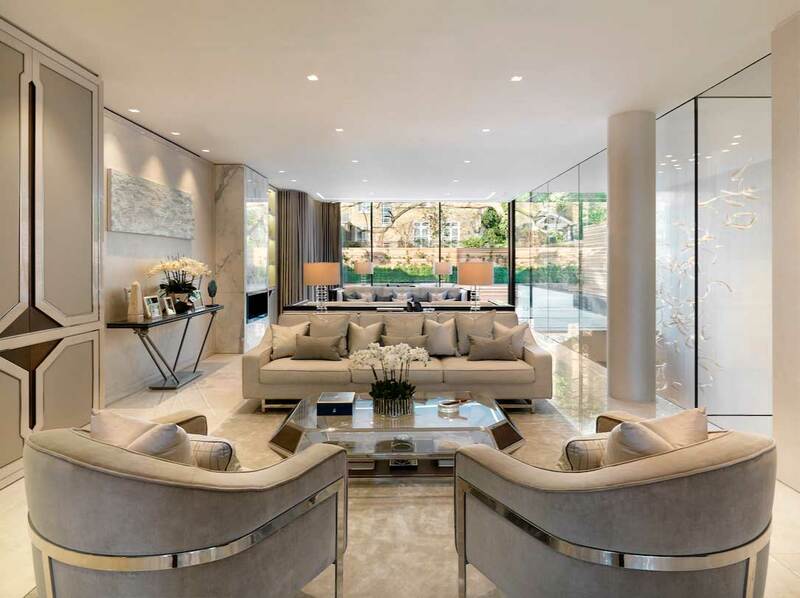 Inspired by the world famous Ashberg diamond, the newly-built “Ashberg House” in Chelsea, London is on the market for $35 million (£28 million), according to press materials. Designed by Morpheus London, the architecture of the five-story residence is influenced by the amber-colored, 102.48-carat diamond that was once part of the Russian Crown Jewels. The traditional brick and stucco styles of homes in Chelsea are boldly contrasted in the design of Ashberg House, with black basalt and bronze detailing throughout its striking glass facade. Softening interior elements balance the sharp, linear exterior with more fluid, organic forms, within its 8,400 square feet. Most of the furniture pieces were custom made for the five-bedroom home. A delicate chandelier, named the “Falling Leaf Chandelier,” is handcrafted with over 140 glass “leaves” in graduated color to complement the seamless sense of indoor-outdoor living. Spanning the entire first floor, the master suite features a series of art panels showcasing “a foliage pattern of hand painted silk and embroidery in pastel tones,” the property website states. In addition to the home’s standard rooms and amenities, there is also a spa, a swimming pool, a steam room, a gym, a theater room, staff quarters, and a wine wall.